CNC-wound from high-strength chrome silicon wire to maintain accurate spring rate and to handle the abuse of hard launches. Has stronger right spring for balanced weight transfer and more consistent 60-foot times. Replaces stock springs without modification. For drag racing only... not for street use! 47510 - Moroso Trick Rear Springs is rated 1.0 out of 5 by 1. Rated 1 out of 5 by AZ Mustang from Bad Fit! first off you will need a spring compressor to install them. 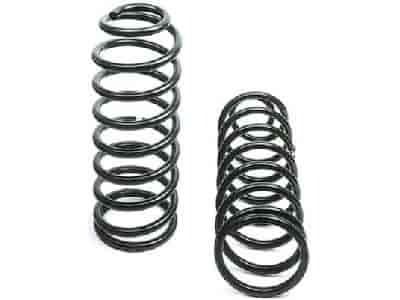 if you are looking to keep the same ride height or a little lower, these are not the springs! they will raise the rear of the car 3". it will have a horrible rear rack to it and extremely stiff!